This high-temperature (premium 1/2" thick) resistant material is only needed for ceramic (tiles, ornaments, etc.) sublimation printing. It is not used for any other purpose. Pick a size after you enter Qty into cart. Note: You can cut this material with a razor if you need a smaller size. Placing tiles face down on the press and heating them from the back is the best way to print ceramic tiles. This procedure provides better contact with the entire surface of the tile and its beveled edges. All you do is place the Nomex felt on the lower rubber bottom platen. The sublimation transfer is placed on the felt, face-up (and slightly towards the back). The tile is centered on the image, facedown. A Teflon sheet is placed over the back of the tile so the tile does not scratch the upper heat platen. Close the heat press for the recommended cycle time. The Nomex felt serves two very important functions. 1) Ceramic tiles have beveled edges and are slightly curved so when the heat press is closed, the tiles are pushed into the felt, which in turn pushes the sublimation transfer tightly around the tiles edges. 2) The second important function of the felt is to keep excessive wear and tear off the lower black heat resistant rubber on the bottom of your heat press. That rubber is expensive and difficult to replace. If you do many tiles, directly on the rubber, it will wear out the rubber quickly and can even become permanently "indented" from the repeated use and extreme pressure. 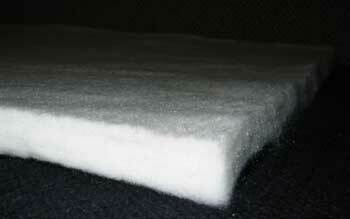 It is important to note - The Nomex felt we offer is 1/2" thick and is thicker than most so you only need one peice.